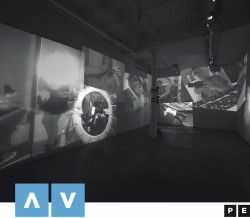 Opening Thursday, December at 19.30 h.
ACVic presents the exhibition Through the looking glass by Joan Fontcuberta in collaboration with Digital Nights. This exhibition gathers two works in which the artist uses resources offered by the internet . Titled Googlegrams and Reflectograms, these works propose to reflect on the importance and increasing use of images, the proliferation of artists, as well as the potential for broadcast and viral dispersion, all of which are growing exponentially with the use of social networks. With Googlegrams Fontcuberta constructs contemporary iconographic compositions using the browser Google. Close up, it can be appreciated that these compositions are made up of a mosaic of thousands of images, thematically related with the resulting composition. 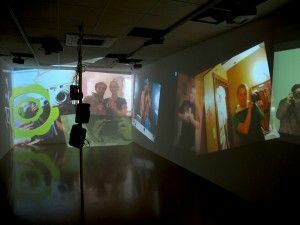 In the exhibition viewers can create their own compositions and incorporate them in the exhibition through a projection. 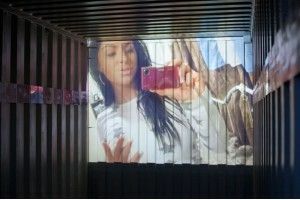 Reflectograms collects from the internet self-portraits by people taking their own picture in the mirror, for uploading to and spreading among social networks. 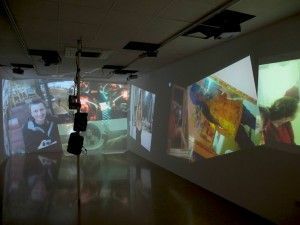 It consists of an overlaid projection of specular self-portraits which transforms the exhibition space, through the confluence of multiple projections, into a saturated stage where a spectacle of overflowed subjectivity occurs. 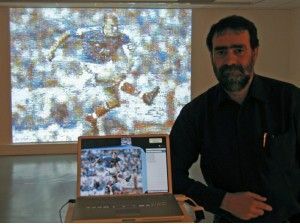 The viewers can add their portrait to the exhibition with a camera and software provided on the premises. Joan Fontcuberta considers there are two types of photographs, decorative, and those that” make you think “. From his earliest works he has chosen the second kind. And as he said in his recent lecture included in the cycle Digital Nights in Vic, but thinking of what?. This is the challenge and the starting point of each of his works, to articulate a set of images that drive the viewer, observer or user towards certain subjects in order to question, discuss or simply reflect upon them. When the images multiply and multiply, the reflections must be considered from the outset of a significant sample. In this case the Internet is the media and the message. A multiplier media and a message that sometimes reaches us filtered (in the case of Google) or saturated (in the case of social networks). Our view is conditioned by these mechanisms. An image can make us think. The multiplication of images does not make us think harder in proportion to number. On the contrary, it stuns and intoxicate us. technique by which an image-model is composed through a reticular structure of small image-models. At a certain distance we recognize the original, but a closer look allows us to appreciate that original is composed by a multiplicity of images. 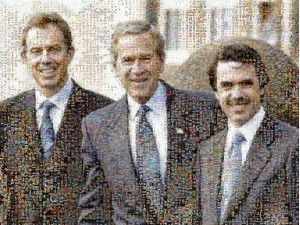 The photomosaic constitutes therefore a species of perceptive palimpsest. a relationship to be established (poetics, dialectics, politics, etc) between the search terms and the matrix image, and between the search terms and the images associated with them at the fixed moment of the search. The device mobilises, then, in an uncontrolled way for the operator, the logical accidents (polysemys, homonymy, superimposition of languages...) and the censorship and filters that the browser also surreptitiously imposes. TRAINING OPEN ACTIVITIES RELATED WITH THE EXHIBITION. With collaboration of Universitat de Vic. Workshop fee 75 eur. One session 25 eur. Workshop fee 100 eur. One session 25 eur. February 19th 2011 from 10am to 1pm. Location: La Farinera, Centre d’Arts Visuals de Vic. C. Bisbe Morgades, 15 Vic. 10% discount in all workshops for members of H. Associació per a les Arts Contemporànies.